When you need a sunvisor, lower it for use in front or swing it to the side. The visor extender extends the sunvisor's range of sun shading. To use, pull it out. 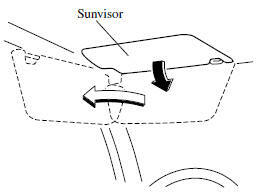 When moving the sunvisor, retract the visor extender to its original position. Otherwise, the visor extender could hit the rearview mirror. To use the vanity mirror, lower the sunvisor. If your vehicle is equipped with a vanity mirror light, it will illuminate when you open the cover.